The U.S. Olympic men’s basketball team’s listless bronze-medal finish in Athens in 2004 led USA Basketball to put longtime NBA executive Jerry Colangelo in charge of returning the luster to its national team program. Colangelo in turn hired his fellow Chicagoan, Duke’s Mike Krzyzewski, as head coach. If it was a risk to choose a college coach for a team of pros, that gamble has paid off. 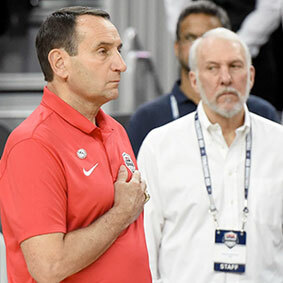 The Rio Olympics will mark the end of Coach K’s nearly 12 years in charge, including three Olympic cycles, and during that time Team USA has gone 52-1 in major FIBA events, collecting four of a possible five gold medals. Is a fifth in its future? While Krzyzewski has restored the American mystique, the days of guaranteed romps are over. The U.S. beat Spain by only seven points in the gold-medal game at the 2012 Olympics in London, and the team that suits up in Rio will feature only two players, Carmelo Anthony and Kevin Durant, with prior Olympic experience. For a variety of reasons, a raft of vets—including LeBron James, Chris Paul, James Harden, Anthony Davis and Russell Westbrook—decided to sit out these Games. Before heading to Brazil, between training camp sessions in Las Vegas, Krzyzewski sat down with SI’s Alexander Wolff to look back at his journey. He talked about building a national team culture, the evolution of the global game, Anthony’s development into an unlikely elder statesman, and the value of following Paul George’s Instagram feed. Their conversation has been edited for brevity and clarity. I imagine you’ve learned a lot over these dozen years from international coaches and players, and wonder if you could share anything specific you’ve taken back to the U.S. team or to Duke. The game is alive and well worldwide, obviously, with 20 to 25 percent of the NBA being international. You have teams that have been together 10, 12, 15 years, like the Argentine team, with their spirit and togetherness, continuity and system.